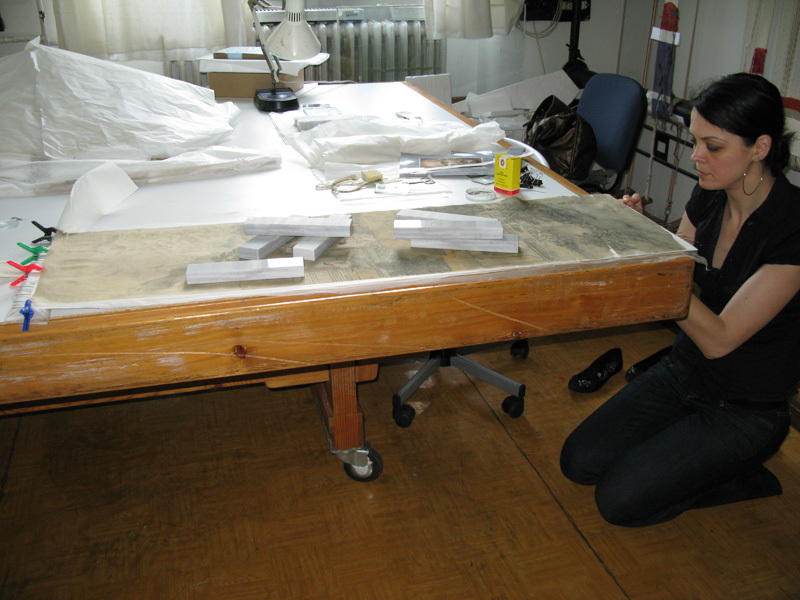 My task was to conserve and amend the weakened, torn and contaminated object. The hardest part of the process was the cleaning of the textile as examination showed that two colours dissolve, so I had to work very fast and gently. I was faced with another complication too: during cleaning the object strongly started to turn undulated. 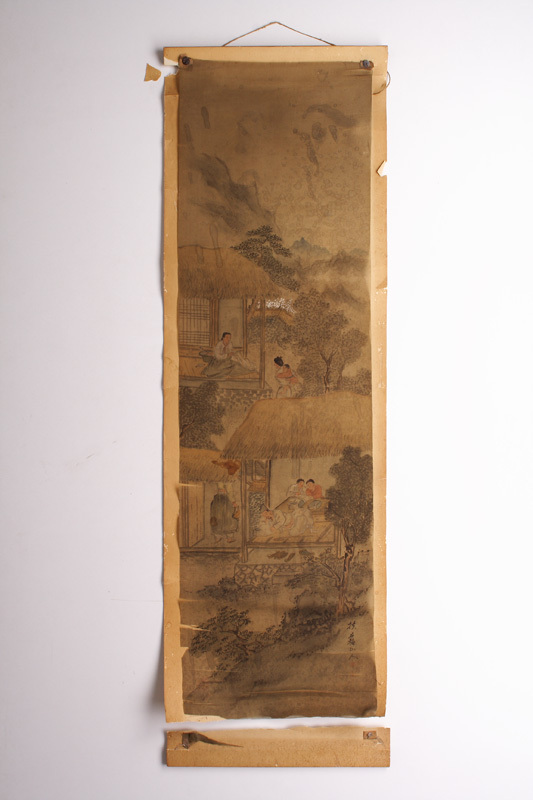 Date and place of origin: the owner acquired the silk picture in the fifties in China. According to expert judgement, it was made in Korea in the early 19th century. 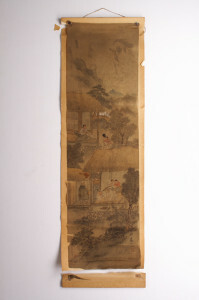 The silk picture can be classified to the genre paintings. It shows a peaceful, calm quotidian scene. It shows a forest landscape with mountains in the background and two houses among the trees. People walk around the houses, running their peaceful everyday lives. We can see among others a mother with her child, a playing couple, and a reading man. The bottom part of the picture has the liveliest colours, the space representation is achieved by a smoother, blurrier usage of paint. The colour palette doesn’t consist of many colours: mainly greens, blue-grays, brown and red shades are used. 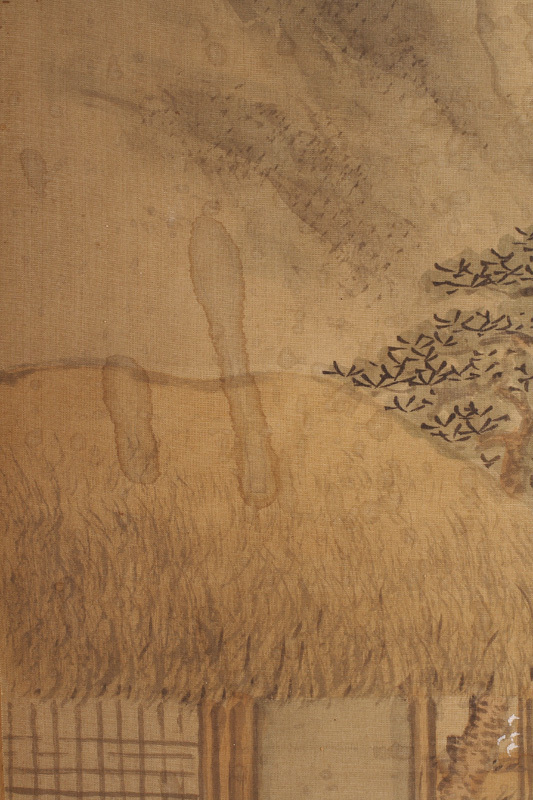 The base is pale green silk and the edges of the cloth-bound textile aren’t worked off. 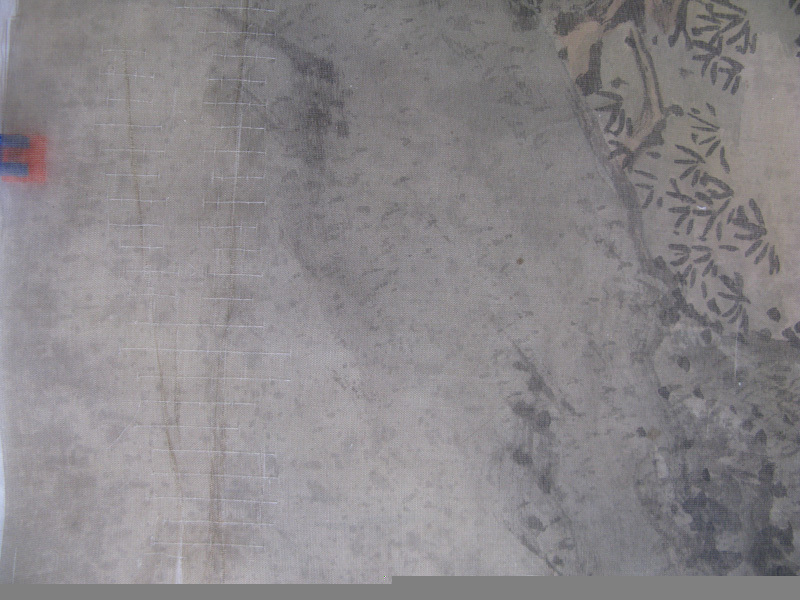 The silk picture was fixed to a cardboard at its four corners with four pins. 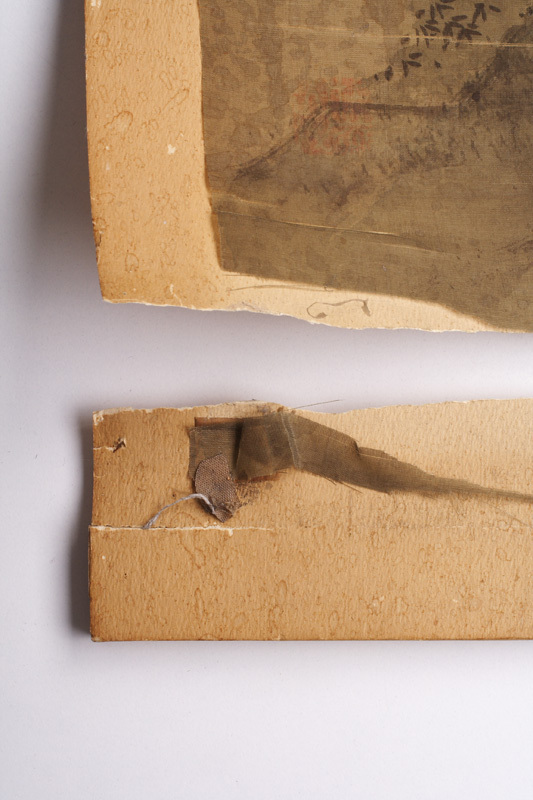 Two staves were attached to the upper and bottom part of the back of the paper, the picture was hung up to the wall by their help. 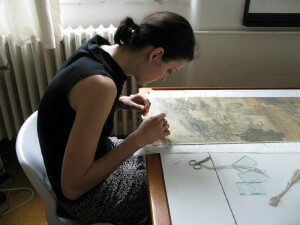 The silk picture was rather dusty and contaminated. It hung on a wall – according the statement of the owner windows were washed next to it and the liquid detergent splashed out to the textile, that’s why the surface is distorted by many stains. 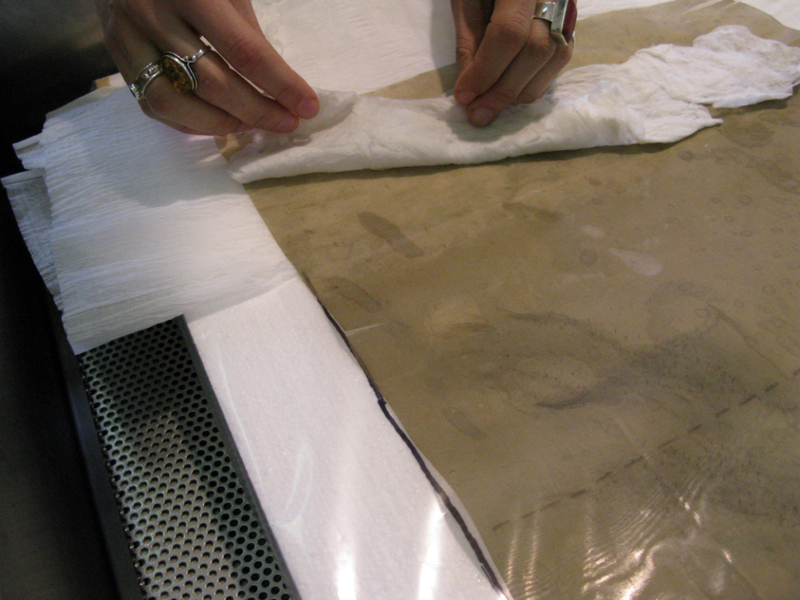 The silk base dried out a little bit, became hard and torn at many points, especially at the bottom. 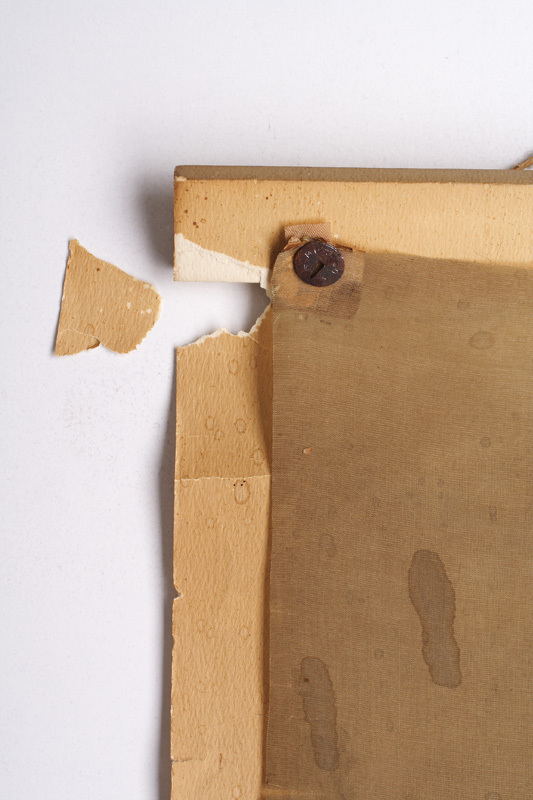 The textile was gappy, as a small part at the lower left corner broke off and the supporting cardboard turned acidulous, splitting up the material in numerous places. Before getting on with the restoration, I made a colour dissolving analysis on the picture. Unfortunately, the results showed that the white colour was dissolving, so a humifying cleaning with surfactants became out of question. I cleared the picture by swabbing it very gently with cotton wool that was dry at the bottom and wet upwards. As the textile got a little bit wet from above, the dry layer mopped up the dirt. With this method I reached a spectacular result. At the end, I fixed it in grainline with insect needles. The first difficulty showed itself at this point: the silk started to be undulated immediately after a bit of humifying. As a next step, I coloured the supporting and additional materials with acidulous paint. 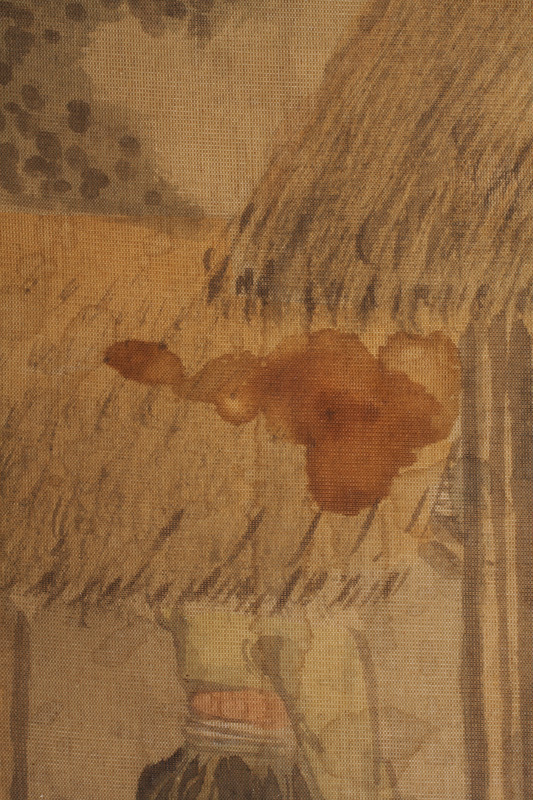 I coloured the silk-like supporting textile in two sections with Lanaset acidulous paint, so its two ends got different shades, fitting to the original picture parts. Then I fixed it in grainline. I painted the sewing threads to two shades and the additional silk layer got colours fitting the missing parts of the original painting. 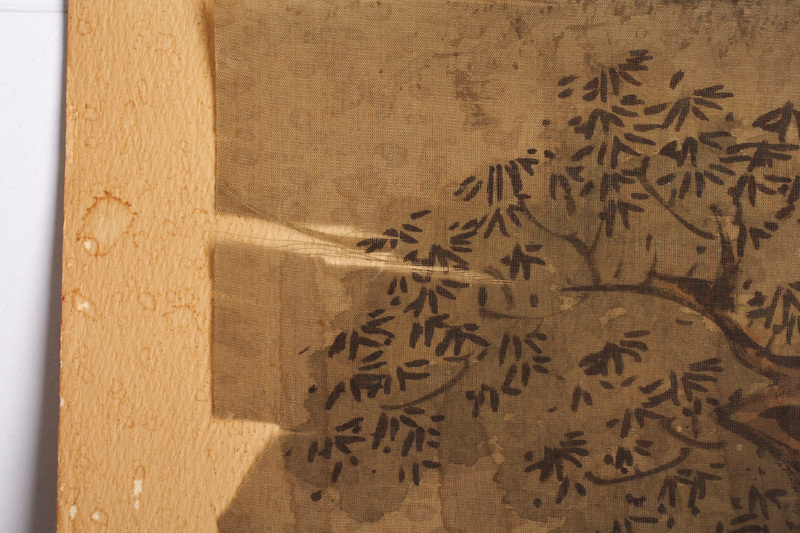 As the first step of supporting and sewing conservation, I fixed the silk to the supporting textile with sliding basting stitches, then conserved the gaps with broad stitches. Before the sewing conservation, I fixed the supporting textile to the surface of the desk, but as it turned out this made working quite difficult. The silk would slide very easily on the desk, so I chose to gradually fix the picture to the supporting cardboard during the process. I stretched it out by its sides, then fixed it to the cardboard with pins. 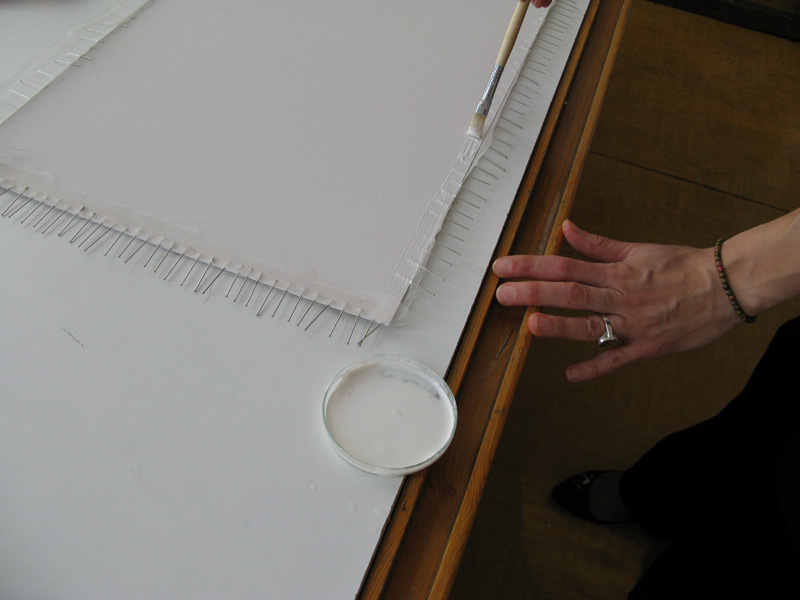 When the picture stood solidly and precisely on the board, I glued the supporting textile to the back of the cardboard with Planatol. 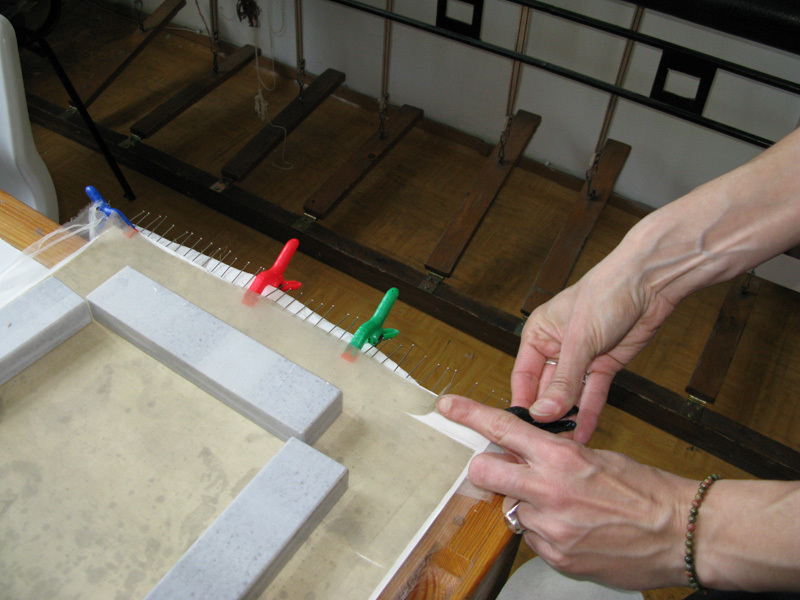 After drying, I continued the sewing conservation which now went ahead much faster and easier. The broad stitches that earlier looked loose now smoothened and turned to grainline. The next step was to replace the missing parts with a similarly thick, coloured textile. I coloured the textile to multiple shades then sewed it punctually to the missing parts. After the cleaning, supporting, sewing restoration and replacements the picture became beautiful and stable again. This entry was posted in Applied Art Works on 2013/09/12 by admin.